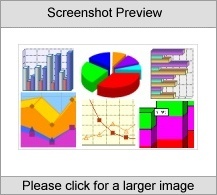 For a limited time, Advanced Graphs & Charts (Applet) - Std License, will be offered for a special of only $199.95 for a limited time for this version! Click here to order now! Powerful components provide both client & server side solutions for adding graphs & charts into web / intranet pages & applications. Enabling web authors & Java developers to easily build and publish dynamic interactive graphs & charts. Try the free trial version first, or click here for pricing/to purchase a full version! Order by phone, fax, cheque, money order, or order securely online!